SMT Discuss is the primary online platform for discussion among members of the Society for Music Theory. Its purpose is to provide a forum for the sharing, discussion, and debate of ideas; for posting questions; and for gathering information. Although the tone of SMT Discuss is informal, it is intended to be an extension of the type of discourse that takes place at theory conferences. Who can read SMT Discuss? Anyone can read the posts on SMT Discuss. Who can post to SMT Discuss? In order to post something on SMT Discuss you first need to register and log in to the site. You do not need to be a member of the Society for Music Theory to post on SMT Discuss. How do I register for SMT Discuss? If you have a Facebook account or a Twitter account, you can choose to sign in automatically through those accounts. You can also register manually by clicking on the "Register" Button. Please use your real first and last name when registering. Select a username and password and supply a valid email address. You will immediately receive an email from SMT Discuss allowing you to confirm that the email address is valid. Once you have registered and logged in to SMT Discuss, you can edit your profile by clicking on the small gear in the left-hand menu and selecting "Edit Profile." Edit Profile: Here you can change your name, username, and email address. You can also add additional information (viewable by other members) about your academic affiliation, research interests, Facebook and Twitter accounts, or personal websites. There are also some customizable profile fields. Change Password: Here you can change your password. 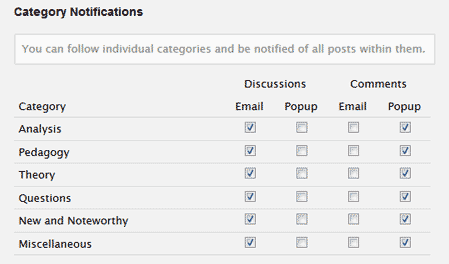 Notification Preferences: Here you can specify how you want to be notified of activity on SMT Discuss. See “How do I customize my email notification preferences?” below for more information. Change My Picture: Here you can optionally upload a picture of yourself. This picture will be displayed next to all of your posts. Edit My Thumbnail: Allows you to edit your thumbnail (only visible if you have uploaded a picture). Ignore List: Here you can edit the list of users whose comments you would like to ignore (if any). See "How do I ignore posts by specific people?" below for more information. Quote Settings: Allows you to control how quotes of previous posts are displayed. Signature Settings: Here you can create a signature that will be added below each of your posts. Creating a (simple) signature is recommended. Who's Online Settings: Here you can indicate whether or not others will be able to see that you are currently "online" (reading SMT Discuss). How many emails will I be getting from SMT Discuss? The amount of email you receive depends on how you set up your notification preferences (see "How do I edit my email notification preferences?" below). You can choose to receive no emails, or you can choose to receive everything through email. New discussion topics on SMT Discuss are all assigned to a specific category. With the default settings, you will receive an email notification whenever a new topic is posted in any of the topic categories. If you would prefer not to be notified of new topics within particular categories (or receive no emails at all), you can uncheck the "Email" boxes under "Discussions." With the default settings, you will not receive email notifications for any of the subsequent comments made in each discussion topic. However, you will see popup notifications if you are logged in to SMT Discuss. If you would like to receive email for all of the comments made in a particular category, check the "Email" boxes under "Comments." (Note that you can also follow specific discussions by bookmarking them. See "How do I follow a discussion that interests me?" below). The "General Notification" settings allow you to specify how you would like to be notified of other types of activities on SMT Discuss, such as people commenting on your profile wall, private messages sent between members, and people mentioning you in their posts. If you are not sure what to do here, just leave these boxes checked. The most important settings are "Notify me when people comment on my discussions" and "Notify me when people comment on my bookmarked discussions." By keeping these checked, you will be notified when someone replies to one of your discussion topics or when comments are made on a bookmarked discussion that you are following. If you would like to block emails from specific individuals, see "How do I ignore comments by specific people?" below. How do I post a new discussion topic? Click on the "New Discussion" button on the upper left on any discussion page. Now you can choose to start a new discussion or to ask a question. Asking a question allows you to select one of the answers as the "Accepted Answer." Choose a meaningful category and title for your discussion topic, then type it into the main box. Click "Post Discussion" to submit your new post. Click "Save Draft" to save your post for later (you can find it later in "My Drafts"). Click "Preview" to see what your post will look like. How do I categorize my discussion topic? Choose the category that best describes your topic. You can only select one: choose "Analysis" for music analytical topics, "Pedagogy" for pedagogical topics, "Theory" for general theoretical topics, "Questions" for questions posed to the "collective wisdom" of the society, "New and Noteworthy" for new publications, websites, blog posts, apps, or other noteworthy occurrences (such as the death of a colleague), or "Miscellaneous" for all other topics. How do I add tags to a discussion? When you start a new discussion, you have the option of adding one or more tags to it. Tags can help to further categorize your post. For example, if you posted a message about Schenker's theory of the Urlinie, you might add the tags "Schenker," "Urlinie," and "tonal analysis" to your post. Tags help readers to quickly find the topics that are of most interest to them. If you click on a tag in the "Popular Tags" section, you will see a list of posts with that particular tag. How do I format and add multimedia or hyperlinks to my posts? Use the toolbar to format your message and add multimedia or hyperlinks. With the toolbar, you can paste your text from another application such as Word. Use the "Paste as plain text" button to remove formatting from copied text. Use the toolbar buttons to format your text (bold, italic, underline, subscript, superscript), add numbered or bulleted lists, change the indentation, or add a block quote. Choose the link icon to add a hyperlink to your post. You can also paste hyperlinks directly into the text editor and they will be correctly formatted. There is a spell checker if you need it. Choose the image icon to link to a picture online (you will need the URL). Choose the image icon to link to a picture online (you will need the URL). You can also insert a table, a horizontal line, or special characters. Lastly, click the "Source" button to see and edit the HTML formatting of your post. How do I add my signature to my posts? You can add a signature to your posts by editing "Signature Settings" in your profile. See "How do I edit my profile?" above. How do I follow a discussion that interests me? To follow a discussion, just click on the star on the right to "bookmark" it . Unless you have changed your notification preferences, you should receive an email for each new comment in a discussion that you have bookmarked, allowing you to keep up with the conversation. (Note that these comments are not moderated by SMT.) You can see all of your Bookmarked Discussions by clicking on the star in the left-hand menu. You can "like" a post by clicking the "Like" button in the upper right-hand corner of each post. The number of likes that a topic has will be displayed on the discussion page. How do I share a post on Facebook or Twitter? Below each post is a small Facebook icon and a small Twitter icon . Clicking either will open a window allowing you to share the post. You will also be able to add your own comments. How do I reply to discussion topics? At the bottom of each discussion page is a "Leave a Comment" section where you can reply to the discussion topic. Note that these replies are not moderated by SMT, but could potentially be flagged by other members. To send a private message to someone else, click on their name to go to their profile page. Click on the "Message" button in the upper right-hand corner to send them a private message. You can also click on the "Send X a private message" link found above discussion comments. How do I quote from another person's post? To quote from another person's post, click the "Quote" link in the upper right-hand corner above their post. This will copy the entire message (highlighted in blue) into your post. You can then select and delete the parts you do not want to quote. How do I "mention" other people in my posts? To mention someone else in your post, type '@' followed by their username (for example: @smt_member). You can find someone's username on their profile page. An autocomplete feature will begin after you type in the first few letters. When you mention someone in your post, they will receive a notification. Is SMT Discuss moderated? What is the moderation policy? New discussion topics are approved by a forum moderator, since these will be emailed to members of SMT Discuss. Subsequent comments are not moderated, and will not be sent by email unless members have chosen to follow a discussion by bookmarking it (see "How do I follow a discussion that interests me?" above). Those posting to SMT Discuss are encouraged to abide by the Guidelines, adhere to standards of courteous professional discourse, and keep to the topic of the thread (if a thread drifts from one topic to another, a new thread should then be started to continue the discussion). If a comment is flagged by a member, it may be removed by a moderator. Repeated flaggings may result in a member being banned from posting on SMT Discuss. To appeal the moderator's decision, you may contact the SMT Networking Ombuds Committee at ombuds@societymusictheory.org). How do I flag an inappropriate post or comment? Above each post you will see a "Flag" link. Clicking the link will send a notification to the SMT Discuss moderator, who will investigate the post and decide whether to allow or remove it. How do I ignore comments by specific people? To ignore someone, click on the person's name to go to her or his profile page. In the upper right-hand corner, click on the "Ignore" button. If someone is on your Ignore List, that person's comments will be hidden by default, but you can reveal them by clicking on the title. You also will not receive emails of postings from any person whom you choose to ignore, even on threads that you are following. You can edit your Ignore List in your Profile Settings (see "How do I edit my profile?" above). Note that you must supply usernames rather than actual names here. Are the discussions on SMT Discuss archived? Yes. Unless removed by the moderator, all discussions on SMT Discuss will be preserved indefinitely. Is SMT Discuss a "phishing site"? No. SMT Discuss is not a phishing site. If you receive a warning about this, you can safely ignore it.